Before we let weapons come between us, from tomorrow, in 48 hours, we will call or a new conference for new laws. We will call for new media laws, civil rights, lift the stupid punishments, we will have a constitution. Even the LEader Gaddafi (sic) said he wants a constitution. We can even have autonomous rule, with limited central govt powers. Brothers there are 200 billion dollars of projects at stake now. We will agree to all these issues immediately. We will then be able to keep our country, unlike our neighbors. We will do that without the problems of Egypt & Tunisia who are now suffering. There is no tourism there. We will have a new Libya, new flag, new anthem. Or else, be ready to start a civil war and chaos and forget oil and petrol. Meanwhile, there is talk of blond women snipers in Tunisia. Scary stuff. 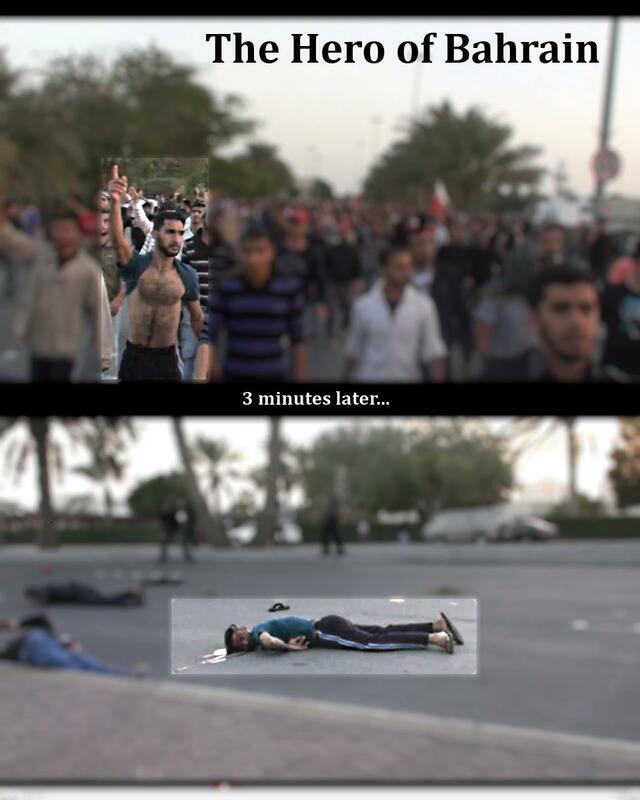 Via Reddit: The hero of Bahrain. Effing bastards. Hussain Abdul-Hussain is the Washington correspondent of the Kuwaiti newspaper Alrai. Not to mention that this appears in The New York Times/IHT.